Sweet Pearl Snacking Tomatoes are smaller than Cherry Tomatoes. 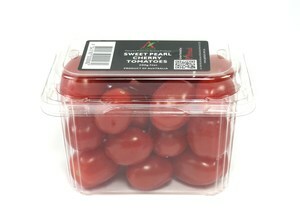 These tomatoes are extremely sweet and less acidic. As the name suggest, these tomatoes are ideal for snacking for both adults and children. Other serving suggestions are in salads, pizza toppings and even in pasta. These tomatoes do not squirt when bitten into so less mess!